One: Food that will totally blow your Instagram. Think that Texas Ranger food couldn’t get crazier or tastier? Think again. The Rangers chefs have taken it up a notch with a smorgasbord of new dining delights: Vegan nachos, chicken-and-doughnut skewers, smoked brisket loaded fries, and the ginormous “Wicked Pig”, a Hawaiian roll layered with pulled pork, thick-cut Danish bacon, split sausage, prosciutto and thick-sliced ham, all covered in barbecue sauce and topped with coleslaw and pork rinds. Yep, we said pork rinds. Find out more about the 2016 Rangers culinary lineup. Two: Concessions, concessions, and more concessions. And speaking of things culinary, did you know that there are more than 100 spots at Globe Life Park where you can grab food and drink of all flavors, sizes, and price points? It’s true, and the Rangers also offer a special all-you-can-eat premium seating area that’s perfect for groups or special occasions. Find out more via this interactive map. Three: A new game for right field. Rangers fans have something extra-cool to cheer about this season, and it’s nothing less than a brand- spankin’ new giant video board that’s recently been installed in left field. For years, fans in right field were cut out of the video board action, since the “old” right field board is positioned above their heads and out of their line of vision. This new left field board changes all that, plus it also features enhanced brightness to counteract the effects of the sunlight that tends to pour into left field from the west, something that’s especially welcome during these dog days of summer. Fireworks Nights, Dollar Hot Dog Days, Blue Bell Ice Cream Sundays, bobblehead giveaways and soooo much more. There’s always something a little extra special going on at the Rangers home games, including discounted ticket opportunities like Coca-Cola Family Packs and $10 Tuesdays. Find the promotion that tickles your fancy the most at texasrangers.com/specials. Your tiny Rangers fan will never forget the time that he or she got to deliver a Game Day ball, take a ride around the bases in-between innings, or start off a Rangers game by yelling “Play ball!” in front of thousands of cheering fans. 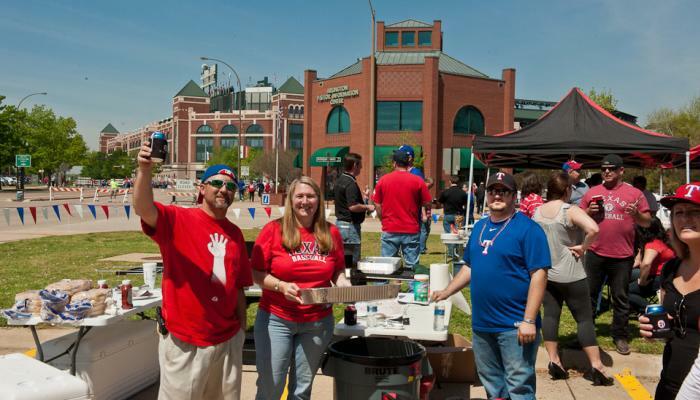 Find out more about Texas Rangers fan experiences available for purchase here. The Rangers Nation need more than a baseball cap to show their solidarity, and the Majestic Grand Slam Gift Shop delivers! Enjoy the largest selection of Texas Rangers licensed souvenirs, apparel, and gifts. How about logod flip flops, blankets, jewelry or garden flags? No problem. Best of all, you can order a custom-made Rangers jersey with a last name and number of your choice! It&apos;s never too early for Christmas shopping, right? Seven: Valet parking? Of course! If you’re a tired tourist looking for a little rest for your feet, a local who is entertaining guests, or you just want to do your Texas Rangers outing in style, you can upgrade to the oh-so-convenient Lexus Valet Parking service, available each game on all sides of the ballpark. Call 972-RANGERS x 1 to reserve or follow on Twitter @RangersInfo for Game Day updates. You plus a Texas Rangers luxury suite equals good times enjoyed in high style. It’s a winning equation any time you want to impress your clients, entertain friends, celebrate a special occasion, or just enjoy a particularly exciting Rangers game in climate-controlled, platinum comfort. Amenities include parking, concierge and attendant service, catering options, private restrooms, indoor and outdoor seating, and flat screen TVs. Find out more here. Feeling lucky? Then you might want to pick up a Texas 2 Split Raffle Ticket during your next trip to Globe Life Park. During each home game, one lucky fan will win half of the ticket sale’s proceeds, with the other half going to the Texas Rangers Foundation to benefit programs for youth education and youth in crisis. Take your Rangers outing to the next level with a pre-game tour of Globe Life Park, where you’ll go behind the scenes to see the batting cages, dugout, press box, and other spots of interest. Held Mondays-Saturdays from 9 a.m. to 2 p.m., leaving on the hour every hour, and Sundays from 11 a.m. to 2 p.m. Subject to Game Day schedule changes.